Have you joined the green smoothie revolution yet? I love them. We all know we have to eat greens, but sitting down to a large bowl of spinach is not always possible (or fun). Green smoothies are a great way to get a big dose of vitamins and minerals in a form that is easy to digest. They are different to freshly squeezed juices, because you use the whole food and the fibre is still intact. They are fantastic if you feel a cold coming on or you are feeling a bit rundown. I absolutely love the flavours in this one I have come up with. Not too sweet, but with a nice zing from the mint. If you don’t like mint, this recipe is also really yummy with a half a lime (with skin) instead of the mint. I need to mention green tea. I hate the stuff. It tastes like grass to me!! But, I know the health benefits are substantial. So, I was looking for ways to drink it, without drinking it. Then it came to me – hide it in a smoothie! Genius (if I do say so myself!). Now, if you want to get reaaaaaaally tricky, you could make up a heap of green tea ice cubes and use them! Ready to make it? This recipe will give you enough smoothie for two to three large glasses. Actually I use the kiddy glass a lot too. It’s a fabulous insulated BPA free tumbler from Oggi with a screw on lid and a non-spill straw. You can get them from kitchen stores. 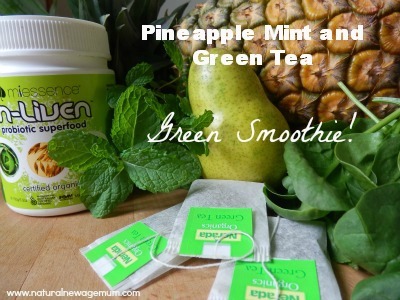 Perfect for green smoothies on the go too. Sip one on your way to work in the car instead of that coffee! Now, a chat about kids and green smoothies. Is it universal that kids have an aversion to green? Or is it just that their young palates prefer sweet things? Anyhow, I had to use all my clever mum tricks on mine before they grew to love green smoothies. Spinach in my drink??? they cried ! Are you serious??? I am sooooo not drinking that !!! 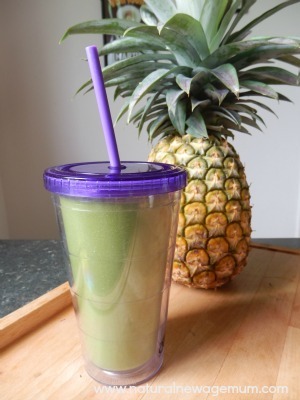 The next time I made a green smoothie, I put it into stainless steel travel mugs. Here darlings, try this lovely smoothie I made you – just keeping it cold in the travel cup. Mmmmmm yummy they say. Open the lid I say! Ha Ha…… green smoothie. One point to Mum! Now, they happily drink green smoothies (as long as I use spinach – some other greens are really bitter and they really make a fuss about that!). Try it out on your kids – you might need a bit of clever marketing – younger kids might think alien juice is pretty cool! It is a fantastic way to boost their daily nutritional intake or to use as a meal replacement if they are feeling a bit sick. If you would like some more ideas for green smoothies, the fabulous Jess Ainscough at The Wellness Warrior is giving away a FREE ebook filled with over 80 green smoothie recipes. I downloaded it. Awesome. So, if you enjoyed this, let me know! 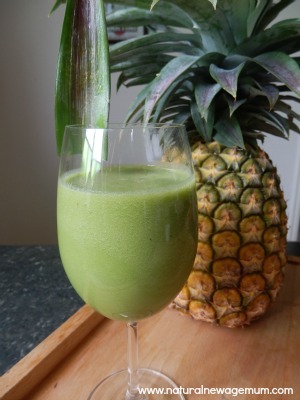 Do you have a favourite green smoothie recipe? I would love to hear it. I love green smoothies! Thanks for the recipe. Do you have a Thermomix? Is it great? I’ve been tossing up the Thermo and the Vitamix. Yes, I have had my beloved thermy for about 18 months now. Would not be without it. I think it is better than the vitamix (I have seen them in action) as you can also cook food like soups, curry, risottos (and a million other things) as well as steaming things with the varoma. It’s worthwhile having a demo in your home to check it out. That’s a ringing endorsement. I think I’ll go with the Therm. I just got a bit distracted with all this recent Vitamix hype. Thanks for the advice. No problem… there are loads of facebook pages and blogs devoted to healthy cooking in the thermomix too… on the right of the blog you will find links to Quirky Cooking and Foodie Mum ! Hi Sonia, this looks delicious! I followed the link from your 10 ways to wake up without coffee, I need all the help I can get! Have you tried this with Kale? I love this, you are my constant helath/eco conscience, always challenging me to go one step further. At present we are in the middle of a seriously crazy soccer season, coaches of 4 teams, secretary, treasurer, president, registrar & fundraising coordinator all under the one roof and made up of 2 people. In the midst of this I have wanted to either delay my morning coffee or put it off altogether, thanks to this Sonia I have been having a morning ‘smoothie’ for a couple of weeks. Look after yourself Dalles -hope the smoothies make a difference! This sounds delish Sonia! Bookmarking for my next one – Have you found the wellness warrior book useful? yes, it is great! lots of different ideas!